The United States Department of Agriculture’s (USDA) Animal and Plant Health Inspection Service (APHIS) is announcing a series of public meetings to receive input on the current Animal Disease Traceability (ADT) system. 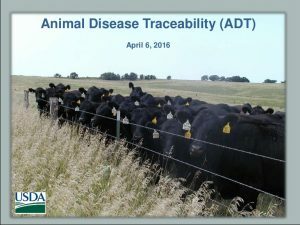 The meetings will allow APHIS to hear from the public about the successes and challenges of the current ADT framework, specifically for traceability in cattle and bison. They will also provide attendees an opportunity to brainstorm ideas about overcoming these challenges and finding ways to fill gaps in the existing system. If you plan to attend a meeting, please register in advance by visiting http://www.aphis.usda.gov/animal-health/adt-meeting-registrations Same-day registration will also be available at each meeting site. In 2013, APHIS published a final rule establishing general regulations for improving the traceability of U.S. livestock moving interstate. The original ADT framework was designed to be flexible to allow States and tribes to meet the animal identification requirements without imposing a one-size-fits-all system across the country. The goal of the ADT system is to know where diseased and at-risk animals are and when and where they’ve been. It helps ensure a rapid response when animal disease events take place. An efficient and accurate animal disease traceability system helps reduce the number of animals involved in an investigation, reduces the time needed to respond, and decreases the cost to producers and the government. APHIS is hosting these meeting to discuss participants’ assessment of the ADT framework and to hear feedback from producers and other sectors of the cattle and bison industry on areas that are working well and aspects to consider for improvements.